The St. John's River is the longest river in Florida at 310 miles, and one of the few north flowing rivers in the US. From the headwaters in the South to its mouth at Jacksonville in Northeast Florida there is only a 30 foot change in elevation and the river flows at a lazy 1/3 of a mile per hour. The St. Johns here is a Blackwater stream, meaning that its primary water supply is fed primarily by the swamps and wetlands that surround it and groundwater seeping up through the sandy soil prevalent in the area, with no major tributaries. Well to the north of the Space Coast Area, the river is as much as three miles wide, supports shipping and is more developed along its shores. However, we are located within what is called the Upper (Southern) Basin of the river and for the 75 miles that the St. Johns flows through this basin it is narrow, shallow, 3-8 feet, surrounded by wetlands and floodplain, and has many side channels or backwaters, is suited for small boats and airboats only and can be confusing to navigate because it can be hard to discern the main course from the backwaters, especially the section west of Titusville between State Road 50 and State Road 46. Shoreline development is minimal and for the most part the view from a boat is much the same as it was 100 years ago. 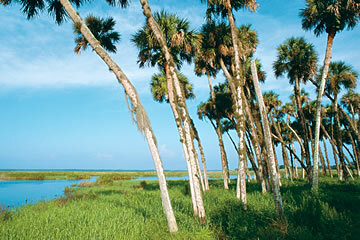 The headwaters begin in the un-navigable swamps surrounding Lake Blue Cyprus in North Indian River County. The river becomes navigable to small craft in southern Brevard County west of the city of Palm Bay, starting just south of Lake Hell 'n Blazes, sometimes spelled Hellen Blazes to satisfy the tender hearted. If you travel North on the river from Lake Hell 'n Blazes you will pass through several notable lakes before you get to the northernmost lake in our coverage area, Lake Harney. They are Hell 'n Blazes (381 acres), Little Sawgrass (100 acres max), Sawgrass (maybe 400 acres), Washington (4,300 acres), Winder (1500 acres), Poinsett (4,300 acres), Puzzle (1300 acres), and then Lake Harney (9 sq. miles). Loughman Lake, and Salt Lake are connected by Six Mile Creek west of Titusville. None of these lakes have any real depth to them. Washington may have depths of about 10 feet in some places but the average is more in the 3-6 foot range. Other tributaries in the upper basin include Taylor Creek near Lake Poinsett and the Econlokhatchee River just south of the bridge at State Road 46. 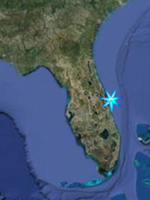 In spite of the fact that Brevard County is over 70 miles in length, (top to bottom) and the St. Johns runs virtually along the entire length, forming the western border, easy public access to the river, especially for shore-bound anglers is limited. The river and its lakes are for the most part protected from shoreline development by the wetlands that surround it There are only 5 roads that actually cross the river's upper basin and they include State Road 192, in Melbourne, State Road 520 from South Cocoa, SR 528 between Cocoa and Titusville, State Road 50 from Titusville, and State Road 46 from Mims. All but State Road 528 have facilities for launching a boat into the river and shoreline fishing. There are a few other shoreline fishing locations where you can fish from shore, launch a canoe or kayak or a boat, some run by the Brevard County Parks and Recreation Department as well as a privately owned fish camp or two that allow shoreline fishing on their properties. These will be covered in greater depth on the Freshwater Locations. While the St. John's River and its lakes are the primary freshwater fishing locations along the Space Coast they are by no means the only places to fish freshwater. Throughout the Space Coast, Freshwater opportunities can be found in various easy to drive to lakes, natural ponds, retention ponds, barrow pits, and even some drainage canals. For the shoreline angler as well as those fishing from canoes or kayaks, these can often be better opportunities than the St. John's. In addition to the lack of dry shoreline access the St. John's has many tight twists and turns. While most motor boaters and air-boaters are conscientious about safety, Traffic can be heavy at times. Other opportunities exist for anglers willing to do a bit of hiking or off road biking well of the beaten path, providing wilderness solitude as well as a chance to fish seldom visited waters. All of these will be discussed on the Freshwater Locations Page. To get the best results from a fishing trip, it is important to understand and be able to visualize what is beneath the surface of the water. Fish don't just hang out anywhere in a body of water. They have preferences in water depth, current strength, and most of all like to be near some sort of cover. Therefore while just randomly casting into water may get you an occasional fish, paying attention to your surroundings and knowing what particular fish prefer can make all the difference in the world. Rarely does a river flow in a straight line. The St. John's has many twists and turns and these bends in the river can provide some good places to check out. Let's say you come to a bend in the river and the turn is to your left. The water closer to the shore on the right side, or outside of the bend will usually be deeper water. The current flushes out bottom sediment and can carve a bowl or hole in the bottom and erodes the outside shoreline away, sometimes creating an undercut bank. There may also be some submerged structure near the outside shore if the current has managed to uproot a shoreline tree. On the other hand, sediment being washed downstream will often collect on the left or inside of the bend and form a shallow sand or mud bar, which will typically get shallower as time goes on. Now if that same bar that has emergent vegetation such as grasses or lily pads growing from it, even though it may be shallower than the rest of the river at that point it may be a good place to try casting a weedless lure for largemouth bass that may be hiding among the vegetation waiting for bait to be swept by with the current. If drifting the river and you come across a fallen tree or other structure along the shoreline, be sure to try the area just downstream of the structure as fish will often hang out where the current has been broken by the structure waiting in ambush mode. Docks, bridge pilings, and other manmade structures can provide the same action. Also look for areas where lily pads, grasses, reeds, and other vegetation is growing from the bottom sediment to at least the water's surface or above. Again this has the effect of slowing a current in the immediate vicinity and providing hunting and ambush cover. Overhanging bushes and trees are great places to target bass bluegills, and other sunfish, especially if you have a few feet of water depth under the outer edge of the branches as insects falling from the tree provides and easy meal. In a lake or pond, many of the same structures that attract fish in the river will also attract them in a lake, with the exception that on a pond or lake, you don't have to pay attention to which is the upstream side or downstream side of the structure. Shoreline vegetation, emergent vegetation, submerged rocks, stumps, stands of cyprus trees in the water, docks, overhanging trees and bushes, and other structure such as logs, brushpiles, and rocks in deeper water can all be great fish attractors. Another thing to look for are clues to the underwater topography of the pond or lake. Where a point of land sticks out from the main shoreline there is a better than average chance that elevation difference extends into the lake, creating a bar or ridge underwater. When a stream or river enters the lake, a deeper channel carved by moving water likely continues into the lake. Even with no shoreline type structure nearby just the change of elevation underwater can attract fish. Largemouth Bass; Common Names - black bass, Florida bass, Florida (or southern) largemouth, green bass, bigmouth, bucketmouth, linesides, Oswego bass and green trout. Habitat - Prefers clear, nonflowing waters with aquatic vegetation where food and cover are available. They occupy brackish to freshwater habitats, including upper estuaries, rivers, lakes, reservoirs and ponds. Also, they can tolerate a wide range of water clarities and bottom types, prefer water temperatures from 65 to 85 degrees, and are usually found at depths less than 20 feet. Spawning Habits - Spawning occurs from December through May, but usually begins in February and March in most of Florida when water temperatures reach 58 to 65 degrees and continues as temperatures rise into the 70s. The male builds saucer-shaped nests 20 to 30 inches in diameter by placing its lower jaw near the bottom and rotating around this central location. Bass prefer to build nests in hard-bottom areas along shallow shorelines or in protected areas such as canals and coves. Feeding Habits - The diet of bass changes with its size. Young fish feed on microscopic animals (zooplankton) and small crustaceans such as grass shrimp and crayfish. Fingerling bass feed on insects, crayfish, and small fishes. Adult bass will eat whatever is available, including fish, crayfish, crabs, frogs, salamanders, snakes, mice, turtles and even birds. Sporting Qualities - The largemouth bass is Florida's most popular freshwater game fish. Much of its popularity is due to its aggressive attitude and willingness to strike a lure or bait with explosive force. They will strike almost any kind of artificial lure or live bait, but most are taken on plastic worms, surface plugs, spinnerbaits, crankbaits, bass bugs and shiner minnows. Eating Quality - The meat is white, flaky and low in oil content. The flavor depends upon the way the fish are cleaned and prepared. The strong weedy taste of bass caught in some waters may be eliminated by skinning the fish and salting and peppering the fillets before battering. Fillets usually are fried, while larger ones may be baked. World Record - 22 pounds, 4 ounces, caught in Montgomery Lake, Georgia in 1932. Uncertified State Record - 20 pounds, 2 ounces, caught in Big Fish Lake (private pond) in Pasco County in 1923. Largemouth Bass are homebodies, meaning they will never stray very far from where they are born. And they will never be far from some type of structure, whether it be an irregularity along the bottom, shoreline vegetation, a clump of submerged vegetation, fallen tree in the water, lily pads, boat docks, rocks, etc. They love cover and will almost always be found near it. They also do not like bright sunlight, which is one reason they stay in cover and the fishing is usually best in early mornings and late evenings. Younger bass will eat almost anything that moves which will fit in their mouths, while older and larger bass seem to prefer a high protein diet of smaller fish and amphibians such as salamanders. They will also go after baby ducks, and the occasional newly hatched alligator. Fish weedless worm rigs and other weedless lures around any structure you find, including all of the afore mentioned areas. Don't miss any points of land you find. When you see mats of duckweed or other floating vegetation, drop an unweighted weedless worm on top and twitch it across the surface of the weeds. Don't be surprised to see a bass explode through the weeds after the lure. When working a shoreline that has grasses growing in the water, and its calm out, watch the grasses. Sometimes you will see one grass stem twitch, creating little rings of ripples in the water when none of the other stems are moving. More times than not this is an indication that a bass is in the grass and has bumped against the stem. Work this area with a weedless worm or other weedless lure. Cast Surface lures such as the Rapala original floating minnow under overhanging trees and branches, or along the edges of emergent vegetation. Spinnerbaits can be fished deep or shallow, or even buzzing the surface. The overall point is, know that bass like cover, and fish it. This is the reason many bass fishermen swear by baitcasting reels loaded with 17# or greater line strength, as with a bit of practice, they can be cast with pinpoint accuracy and have the backbone to get a bass out and away from cover before it has a chance to wrap your line around some structure. Size and possession limits apply. Black Crappie; Common Names - speckled perch, specks, papermouth, bachelor perch, calico bass, strawberry bass, or white perch. Habitat - Black crappies thrive in clear, natural lakes and reservoirs with moderate vegetation. They are also found in large slow-moving less turbid rivers, provided the water is not too murky. Crappies prefer water from 70 to 75 degrees but will tolerate water over 80 degrees. It is gregarious and often travels in schools. Spawning Habits - Spawning occurs from February to April when water temperatures reach 62 to 65 degrees. They nest in colonies. Circular nest are fanned by males over gravel or soft-muddy bottoms and frequently around submerged vegetation in waters from three to eight feet deep. After spawning, males guard the eggs and fry. Females may produce between 11,000 and 188,000 eggs. Feeding Habits - Primary food items are crustaceans, aquatic insects and small fishes. Adults mainly eat small fish, particularly open-water forage fish, like threadfin shad. Sporting Quality - Black crappies are excellent game fish and are highly regarded by bait fishermen and artificial-lure anglers alike. They are easily caught during prespawning periods when the fish are congregated in large schools. Trolling with small, live minnows or a spinner-fly combination is very productive. They will also strike subsurface flies, small spinners, jigs, and tiny crankbaits. Crappies tend to suspend in midwater, so you may have to experiment to find the right depth. As a sport fish, specific bag and size limit regulations apply, and you can register a qualifying catch as part of the Florida Fish and Wildlife Conservation Commission's "Big Catch" program. 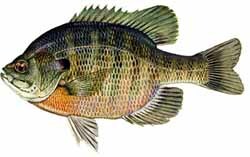 Bluegill; Common Names - bream, blue bream, sun perch, blue sunfish, copperhead, copperbelly, roach. Habitat - Bluegills prefer the quiet, weedy waters where they can hide and feed. They inhabit lakes and ponds, slow-flowing rivers and streams with sand, mud, or gravel bottoms, near aquatic vegetation. Spawning Habits - Bluegills are well known for "bedding" in large groups, with their circular beds touching one another. Bedding occurs in water two to six feet deep over sand, shell or gravel, and often among plant roots when the bottom is soft. Spawning occurs from April through October with the peak in May and June, when water temperature rises to about 78-80 degrees. A female may lay 2,000 to 63,000 eggs, which hatch 30 to 35 hours after fertilization. Feeding Habits - Insects, insect larvae and crustaceans are the dominant foods of bluegills, with vegetation, fish eggs, small fish, mollusks, and snails being of secondary importance, although they may dominate their diet during certain times of the year. Sporting Qualities - Because of its willingness to take a variety of natural baits (e.g., crickets, grass shrimp, worms) and artificial lures (e.g., small spinners or popping bugs) during the entire year, its gameness when hooked, and its excellent food qualities, the bluegill is one of the more important sport fish in Florida and the eastern United States. As a sport fish, specific bag and size limit regulations apply, and you can register a qualifying catch as part of the Florida Fish and Wildlife Conservation Commission's "Big Catch" program. Eating Quality - Excellent; the flesh is white, flaky, firm and sweet. They are generally rolled in cornmeal or dipped in pancake batter before frying. Many rank the bluegill as the most delicious of all freshwater fish. Redear Sunfish; Common Names - Widely known as shellcracker because of its fondness for snails. Also called bream, yellow bream. Habitat - Redear are found in almost every freshwater aquatic system in Florida. They are typically found on sandy or shell-covered areas of ponds and lakes, and are often located near grasses. Redear spend a great deal of time offshore in open water, particularly in the winter. Other redear found in rivers prefer, quiet waters and have a tendency to congregate around stumps, roots and logs. They are common in lower, more slowly flowing reaches of rivers. They tolerate brackish water better than other sunfish. Like black bass and spotted sunfish, they may be abundant in tidal areas near the mouths of rivers. Spawning Habits - Spawning occurs during May, June and July (March through August in central Florida) when water temperatures reach 70 degrees. They prefer water three to four feet deep, and a firm, shelly bottom, often near a dropoff. Nesting sites are often near aquatic vegetation such as water lilies, cattails, lizardtails, and maidencane. Breeding behavior is similar to other sunfish, with the males doing the nest building and guarding the young. A female may lay between 15,000 to 30,000 eggs during a spawn. Feeding Habits - Redears are opportunistic bottom feeders, foraging mainly during daylight hours on a variety of invertebrates. Important food items include snails and clams which are crushed by grinding teeth in the throat; larval insects, fish eggs, small fish, and crustaceans. In some areas snails may be secondary to insects as a food preference. Sporting Quality - Strong fighters, but more difficult to catch than most other sunfish. The redear does not readily take artificial lures but is easily taken on natural baits. Most fish are taken on cane poles with small hooks, corks, and split shot for weight. Favorite baits are worms, crickets, grubs, and shrimp fished in the spring and summer during the bedding season. Later in the season they move to much deeper water or into heavy cover, where they are difficult to locate. As a sport fish, specific bag and size limit regulations apply, and you can register a qualifying catch as part of the Florida Fish and Wildlife Conservation Commission's "Big Catch" program. Eating Quality - Similar to that of bluegill, with white, flaky, sweet-tasting meat. Prepared the same as bluegill. Redbreast Sunfish; Common Names - redbelly, robin, yellowbelly sunfish, bream, river bream, longear sunfish, sun perch and redbreast bream. Habitat - Redbreasts inhabit sand-bottom areas as well as rocky areas of coastal-plain streams, rivers, and lakes. They frequently concentrate around boulders, limestone outcroppings, logs, aquatic vegetation, or in undercut tree roots. Spawning Habits - They reproduce in typical sunfish fashion by constructing circular beds; but not clustered like bluegills, in water from one to three feet deep usually adjacent underwater objects such as stumps and snags. They often occupy beds that have been abandoned by other sunfishes. Spawning occurs from May through August when water temperatures range from 68 to 82 degrees. Males are the nest builders and guard the eggs and larvae for a short period after hatching. The number of eggs laid in a season ranges from about 1,000 to 10,000, varying with the age and size of the female. Feeding Habits - The redbreast's diet is probably the most varied of any of the sunfishes. Principal food organisms are bottom-dwelling insect larvae, snails, clams, shrimp, crayfish, and small fish. Sporting Qualities - Redbreasts are prized game fish and are caught on natural baits and artificial lures. They a good fighters and will bite on flies and small spinners, as well as worms, crickets, grasshoppers and small minnows. Unlike most sunfishes, redbreasts bite well at night. Fishing from a drifting or slowly powered boat is the best way to catch redbreasts, although angling from the bank can be productive. As a sport fish, specific bag and size limit regulations apply, and you can register a qualifying catch as part of the Florida Fish and Wildlife Conservation Commission's "Big Catch" program. Eating Quality - The sweet, flaky, white flesh is excellent eating. They are most often fried after dipping them in seasoned cornmeal or pancake batter. Spotted Sunfish; Common Names - stumpknocker and bream. Habitat - The preferred habitat is slow-moving, heavily vegetated streams and rivers with limestone, sand, or gravel substrates. They are virtually ubiquitous inhabiting large rivers to very small creeks. Spawning Habits - A nest-building sunfish that tends to be more solitary than some of the other members of the sunfish family. Males are very aggressive and antagonistic toward other fish in its nesting area. The beds are about one foot in diameter and are fanned out by the male, who also stands guard over the eggs and larvae. Concentrations of beds are found where suitable habitat is limited. Spawning takes place from May through November. Feeding Habits - This species is very aggressive and will take almost anything they can attack and catch. They generally feed on the bottom, but sometimes it will rise to the surface to take food. Spotted sunfish will feed on invertebrates, insects and small fishes when they are easy to catch. The bulk of their diet consist of a variety of plants and animals that are usually associated with aquatic vegetation, brush, or rubble. 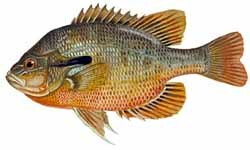 Sporting Qualities - Because of its small size the spotted sunfish has limited value to the angler, but it is an active and fiesty panfish. The same methods of fishing discussed for the redbreast sunfish apply for the spotted sunfish. As a sport fish, specific bag and size limit regulations apply, and you can register a qualifying catch as part of the Florida Fish and Wildlife Conservation Commission's "Big Catch" program. Eating Quality - The flesh is excellent. Preparation is the same as the redbreast sunfish. Flier Sunfish; Common Names - round sunfish and millpond flier. Habitat - They inhabit dark, acidic waters of coastal swamps, creeks, ponds, and canals. They prefer heavily vegetated water and are often found under mats of floating vegetation. Fliers can tolerate waters too acidic for other sunfish. They prefer water temperatures from 75 to 85 degrees. Spawning Habits - Spawning begins in March when water temperatures reach 62 to 68 degrees. The male prepares a nest and the female lays from 5,000 to 50,000 eggs. Nesting may be solitary or in small colonies. Males continuously guard the eggs and recently hatched young. Feeding Habits - Fliers are carnivorous in their feeding habits. They prefer insects, crustaceans, mollusks, worms, leeches, and small fish are supplemented with small quantities of phytoplankton. Sporting Qualities - Although fliers fight well for their size, they are often too small to generate much interest among anglers. Fliers can be caught on dry flies, tiny poppers, worms, insect larvae and small minnows. Good fishing locations are around cypress trees and stumps, near brush piles, and at the mouths of small creeks and canals. As a sport fish, specific bag and size limit regulations apply, and you can register a qualifying catch as part of the Florida Fish and Wildlife Conservation Commission's "Big Catch" program. Eating Qualities - The flesh is sweet and excellent to eat. The same methods of cooking other sunfish apply for fliers. Warmouth; Common Names - warmouth bass, warmouth perch, goggle-eye, redeye and goggle-eyed perch. Habitat - Warmouths inhabit swamps, marshes, shallow lakes, slow-moving streams and canals with soft, muddy bottoms. They prefer to stay around aquatic vegetation, stumps, and snags and under the banks of streams and ponds. They have more tolerance for muddy water than most species. Spawning Habits - Warmouths are solitary nesters that prefer to build their nest adjacent to some submerged object. Nests are found over a wide range of water depths. They often spawn more than once a year usually between April and August. Females may produce 3,000 to 23,000 eggs. Feeding Habits - Warmouths are carnivorous. Crayfish, shrimp, insects and small fishes make up the bulk of its diet. Most of its feeding is done in the morning, as it seems to sleep at night. Sporting Qualities - The warmouth is one of the more easily caught sunfish by anglers using cane poles and natural baits, spinning tackle with small topwater lures and shallow-running spinners. They strike hard, frequently breaking the surface of the water. The best place to catch warmouths is shallow water around trees, stumps, or vegetation. As a sport fish, specific bag and size limit regulations apply, and you can register a qualifying catch as part of the Florida Fish and Wildlife Conservation Commission's "Big Catch" program. Eating Quality - The warmouth are good to eat when caught from clean water. Like other panfish they are relatively small and bony. The flesh is usually prepared by deep-frying after rolling it in seasoned cornmeal. Chain Pickerel; Common Names - Pike, river pike, grass pike, jack, jackfish, eastern pickerel, chainsides, mud pickerel, black chain pike, duck-billed pike. Habitat - Normally found in vegetated lakes, swamps and backwaters, and small to large rivers. They prefer water temperatures from 75 to 80 degrees. Spawning Habits - Chain pickerels are random spawners rather than nest builders. Spawning occurs in late winter to spring among heavy aquatic weed growth or flooded grasses, in water from a few inches deep to several feet deep. Large number of adhesive eggs are scattered over vegetation. No nest is constructed and no parental care is given to the eggs or fry. About three to four weeks after hatching, they begin cannibalizing other fry. Feeding Habits - The chain pickerels diet is mainly fish. They also eat insects, frogs, mice, crayfish and a wide variety of other foods. Sporting Quality - Although not so common as the black bass, chain pickerels are often encountered by bass anglers, especially while plug casting. They are good fighters, especially on light tackle. Productive lures include spinner baits, weedless spoons, surface plugs, crankbaits and jigs. Minnows are a reliable year-round bait. Eating Quality - The white, flaky meat is good tasting, but quite bony. Redfin Pickerel; Common Names - Little pickerel, mud pickerel, grass pickerel, banded pickerel, redfinned pike. Habitat - Usually found in among heavy growths of aquatic plants in sluggish streams, in shallow coves of lakes or in ponds. They prefer water from 75 to 80 degrees. Redfin pickerels may be the dominant predator fish in small creeks. Spawning Habits - Spawning occurs in the spring in shallow, weedy waters. Eggs are adhesive and are scattered freely among submerged vegetation. They become sexually mature by at least age two. No parental care is given to the eggs or fry. Sporting Quality - These pickerel are scrappy fighters, but its small size limits their popularity as sport fish (World record = 1.5 lbs). They can be caught on minnows, streamers, small spinners, spoons and plugs. Redfin pickerel are a lot of fun to catch on light spinning tackle. Eating Quality - White, flaky, sweet-tasting meat, but quite bony. Channel Catfish; Common Names - spotted cat, blue channel cat, river catfish. Habitat - Most common in big rivers and streams. Prefers some current, and deep water with sand, gravel or rubble bottoms. Channel catfish also inhabit lakes, reservoirs and ponds. They adapt well in standing water where stocked. Spawning Habits - Spawning occurs mostly in rivers and streams in the spring and early summer when waters warm to 70 to 85 degrees. They also will spawn in larger lakes where suitable habitat is available. Eggs are deposited in nests secluded under banks or logs or over open bottom. The male selects the site, often a natural cavern or hole, clears the nest and guards the eggs and young. A female may lay 2,000 to 21,000 eggs that hatch in six to 10 days depending on water temperature. Males protect the fry until they leave the nest in about a week. Feeding Habits - Feeds primarily at night using taste buds in the sensitive barbels and throughout the skin to locate prey. Although they normally feed on the bottom, channels also will feed at the surface and at mid-depth. Major foods are aquatic insects, crayfish, mollusks, crustaceans and fishes. Small channels consume invertebrates, but larger ones may eat fish. Contrary to popular belief, carrion is not their normal food. Sporting Qualities - Most channels are caught by bottom fishing with baits such as dried chicken blood, chicken livers or gizzards, and nightcrawlers. They prefer dead or prepared stinkbaits to live bait, but at times will take live minnows and lures such as spinners and jigs. Strong fighters with good endurance, they are frequently caught on trotlines. Since channel catfish can also be taken by commercial fishermen, except where stocked by the Commission, they are not legally classified as sportfish. However, specific regulations apply and they are eligible for the "Big Catch" program. White Catfish; Common Names - forked-tail cat, catfish. Habitat - Usually found in slow-moving streams, river backwaters, reservoirs and ponds. They will tolerate a siltier bottom and higher salinity, and prefer water temperatures of 80 to 85 degrees. Spawning Habits - As with other members of its family, they are nest builders, and the male guards the young for some time after they hatch. Both parents help excavate the large nest, usually on a sand or gravel bar. Spawning occurs in the early summer when waters reach about 70 degrees. Feeding Habits - Although fish are their major food, whites also eat larval aquatic insects, small crustaceans, fish eggs and aquatic plants. They may feed at night, but are not as nocturnal as other catfish. Sporting Qualities - Among the catfishes found in Florida, the white is second only to the channel catfish in popularity. Live bait, especially minnows and worms, accounts for most caught whites, but they also will take cut and prepared baits. Since they can also be taken by commercial fishermen, no specific regulations currently apply but they are eligible for the "Big Catch" program. Eating Quality - An excellent food fish, whites are prized for their firm, white flesh. Brown Bullhead; Common Names - creek cat, mud cat, horned pout, red cat, speckled cat. Habitat - Browns generally inhabit still or slowly-flowing warm waters in ponds, lakes, reservoirs, large rivers and sluggish streams. They prefer water temperatures of 78 to 82 degrees, but can survive in warmer waters. They inhabit areas with mud or deep muck as well as sand or gravel bottoms. Spawning Habits - Browns are nest builders and often select a site next to some underwater object such as a rock or log. Both parents often care for the eggs, and guard the young up to a size of one inch. At times the parent fish have been observed picking up the eggs or fry in their mouths to clean them, depositing them back in the nest afterwards. Feeding Habits - They are primarily bottom feeders, feeding mostly at night. Highly sensitive barbels enable them to smell a wide variety of food such as insects, plant material, carrion, small fish, snails, crayfish, worms and leeches. Sporting Quality - Fair fighters, they are easy to catch with baits such as worms, minnows, shrimp, chicken innards and stinkbait. They bite throughout the day, but fishing is best at night. Eating Quality - A good food fish, only slightly inferior to the white and channel catfish, if caught from clean waters. Yellow Bullhead; Common Names - butter cat, yellow cat, creek cat, white-whiskered bullhead, greaser, polliwog, chucklehead cat. Habitat - The habitat is variable and includes vegetated areas of clear, shallow lakes, reservoirs, ponds, and slow-flowing streams. They are more tolerant of polluted environments than most other members of the catfish family. Spawning Habits - Spawning occurs in May and June as a rule, with eggs deposited in a nest usually adjacent to a submerged object. One or both parents take part in building the nest, and take turns caring for the eggs, which may number 2,000 to 4,000 and hatch in five to 10 days. The male guards the eggs and fry. Feeding Habits - Though scavengers, yellow bullheads prefer to feed on minnows, snails, shrimp and crayfish. They also will feed on insect larvae, vegetation and decaying organic matter. Scent and taste play a vital role in their feeding, most of which is done at night. Sporting Qualities - Easy to catch on cut bait, worms, crickets, doughballs and a wide variety of natural and prepared baits. They can be caught at any time of day, but bite best at night. They are not strong fighters. Since they can also be taken by commercial fishermen, no specific regulations currently apply but they are eligible for the "Big Catch" program. Eating Quality - They are important as a food fish in some areas and are the dominant species in some waters. The creamy flesh is quite good when taken from clean water. American Shad; Common Name - Shad. Habitat - Anadromous; lives most of its life at sea. Spawning Habits - Most spawning occurs between late December and early April in the stretch of the St. Johns River from Sanford to Melbourne. Eggs are spawned directly into the river where they drift freely for 2-3 days. Juveniles leave the river when it cools in late fall or early winter. Juveniles mature into adults in the Atlantic Ocean and do not return to the St. Johns River until they are ready to spawn, two to five years later. In the St. Johns River and all other rivers below Cape Fear, North Carolina, shad die after they spawn. Feeding Habits - Plankton feeders, but strikes small bright spoons and flies. Sporting Qualities - Historically the sport fishery was mostly a troll boat fishery with some spin casting from the bank. In recent times, fly fishing has become very extensive. Recreational fishing began in the early 1940s near Deland. The sport fishery is primarily located between Sanford and Melbourne. Eating Quality - Flesh good. especially smoked; roe is excellent.